Modern Employment Law covers all aspects relating to the employment relationship between employer and employee at both individual and collective levels. All chapters are absorbing and exact, with nuanced topics such as unfair dismissal, discrimination and trade union law being explored from several different angles. Pedagogical features such as Thinking points and Further reading sections enable students to consolidate and extend their knowledge. 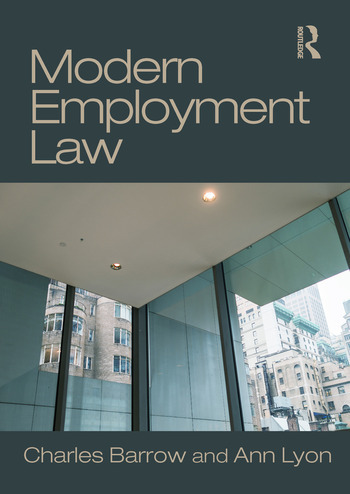 Though primarily aimed at LLB students, this book offers a wide-ranging, accurate, authoritative, contemporary and readable guide to modern employment law for all students of the subject, at both undergraduate and postgraduate level. Although a collaborative effort, each author focused on specific areas of employment law. Ann Lyon examined the statutory rights of employees including topics such as redundancy, unfair dismissal and discrimination and equal pay issues. Charles Barrow had primary responsibility for the introduction, the majority of the contract of employment chapters and the collective aspects of employment law. Charles Barrow, BSc (Econ), LLM (LSE), Cert Ed, Barrister-at-Law, is Senior Lecturer at Brighton Business School. Ann Lyon, BA(Hons) History, MA Medieval Studies, York, MPhil Archaeology, Durham, is Senior Lecturer at the School of Law, Criminology and Government (Faculty of Business), University of Plymouth.